In Notes from the Conservation Front Line adventurer-biologist Dr. Niall McCann takes audiences on an amazing journey as he describes his often dangerous work researching and protecting endangered species in remote and challenging environments. He describes how he’s been able to bridge the gap between science and policy, and how his work in human-wildlife conflict has led him to develop a career in anti-poaching. In addition to his work in research and conservation, Niall hosted two seasons of the Nat Geo Wild TV series Biggest and Baddest, which focused on human-wildlife conflict. 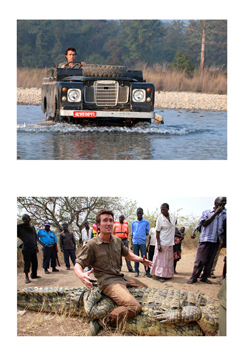 In filming the show, Niall participated in medical interventions on mountain gorillas with the Gorilla Doctors, worked with the Bronx Zoo’s WCS to collar and track the rare tree-climbing lions of Ishasha, and joined rangers of Uganda’s Wildlife Authority to trap giant man-eating Nile Crocodiles and re-locate them to a National Park hundreds of miles away. While filming the series Niall was charged by a tiger, treed by an elephant, and dragged down a sandy bank by an anaconda. In addition to being hugely enjoyable, working on the show highlighted to Niall the importance of working with communities to mitigate human-wildlife conflict all around the world. In 2003, while still an undergraduate, Niall ran an expedition to Bolivia to study giant otters. The experience gained in running this expedition with its complex logistics within a challenging country was hugely important in shaping his career. 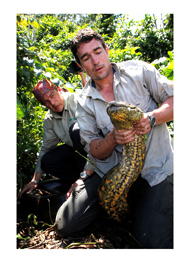 In 2009 Niall returned to South America to conduct the first biodiversity survey of the upper Rewa River in Guyana. Travelling by boat over 150 miles upriver from the last Amerindian settlement, Niall and colleague Dr. Rob Pickles uncovered a treasure trove of incredible animals: giant otters, massive Anacondas and charismatic tapir. On returning from this expedition, Niall and Dr. Pickles lobbied to protect the area from gold mining, Niall’s first experience of ‘real’ conservation work. Niall has worked extensively in Honduras, where he completed his PhD on the conservation of Baird’s tapir. Honduras is the least-studied co untry in Central America in terms of biodiversity; it also has the highest murder rate in the world and a complicated political and social environment that make working there highly challenging and extremely rewarding. Niall lobbied the government to protect a threatened National Park, and is still involved in conservation work in the country, today. Recently, Niall became more involved in anti-poaching operations, and in 2016 he helped establish National Park Rescue, a charity dedicated to the protection of Africa’s wildlife, currently experiencing slaughter on an unprecedented scale. Niall has dedicated his career to combating the rampant corruption and ruthless poaching that threatens many of the world’s most charismatic species, and what is certain is that there will be many more adventures ahead of him!